Bright and spacious two bedroomed apartment with sea views and stunning sunsets. Bright, spacious and spotlessly clean top floor apartment with sea views and stunning sunsets in a characterful Victorian building. Originally a townhouse, converted into five split level flats circa 1979. 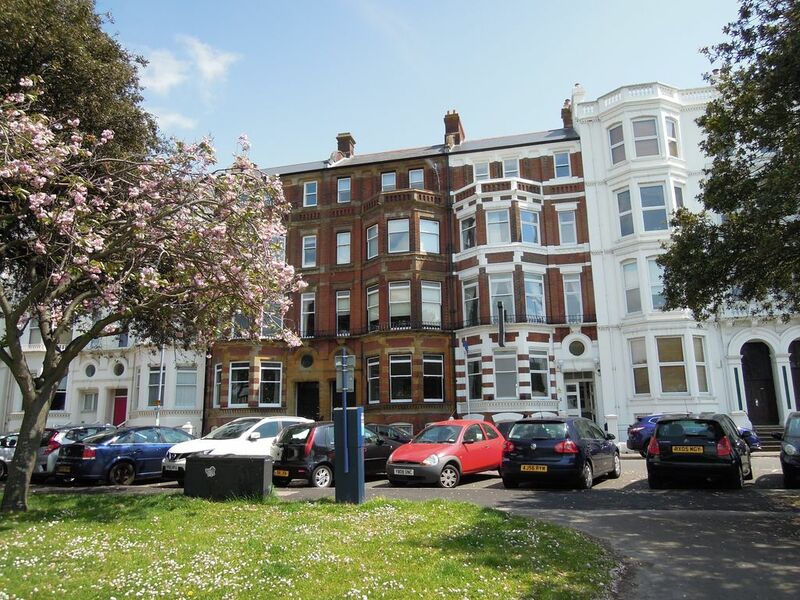 The apartment is located in central Southsea on the seafront in a conservation area. It has views out to Southsea Common, the Solent, Isle of Wight and Spinnaker Tower. The accommodation is ideal for small families, couples, solo and business travellers. The apartment is excellently located. It is minutes from Palmerston Road with its many eating places and shopping precinct (including a Waitrose supermarket) and a short walk from Old Portsmouth (15 minutes). Only slightly further away is Gunwharf Quays and the Spinnaker Tower, the Historic Dockyard and Central Portsmouth (20-25 minutes). We’re also minutes from the Isle of Wight Hoverport. The apartment has large sash windows with wonderful views and stunning sunsets. The accommodation comprises of a large living room with dining area; large double bedroom with Super King size bed, plenty of cupboard space and en-suite wc; a twin room with two full size singles and views to the seafront; a completely new kitchen, fully equipped with everything you might need in a home away from home; and a new bathroom suite with an electric shower. We supply high quality bed linen and towels with our accommodation. The apartment is on the top third floor of the building, there is no lift. A car is useful but not essential. For those with a car, parking permits are available for parking in the local area. For those without, there is a good local bus and train service. The closest train station is Portsmouth Harbour. Southsea, Portsmouth is a perfect location for any type of holiday and at any time of year – short city breaks, surprise Valentine’s/ anniversary getaways, Easter holidays, educational half term breaks, summer holidays by the sea, the Great South Run, Christmas and January Sales shopping. There is something for everyone. It is an ideal location for a holiday in Britain no matter what the weather or the time of year. As well as ideally located for visiting Portsmouth, the apartment is a perfect base for visiting the south coast and key locations further afield – central London is only 90 minutes away by train. The apartment is located within a special, typically Victoria building, one of the few left in Southsea with many of its original features. It forms part of the Seafront Conservation Area. It is a residential building with only four other apartments. We're located in the most perfect spot to explore the whole of the city. We're on the doorstep of Southsea Common, minutes away from shops, restaurants, beach walks, Clarence Pier & Funfair and children's playground; and no more than half an hour walk to all of Portsmouth's attractions. Bathroom with wc, full size sink over vanity unit and shower (no bathtub). Electric shower. Parking available in local area. Parking permit required and can be provided; they cost £2 for 24 hours. Towels provided (not beach towels). Salt, pepper, vegetable oil, cling film, and foil usually provided. Fully equipped new kitchen with dining table and chairs. Two dining areas - in kitchen and living room. A small selection of books. •	This is a top third floor apartment, we have no lift but stairs are not steep •	The apartment is usually furnished with a few extras like foil, cling film, washing-up liquid, sponges, cloths, a few cleaning products; and a few pantry items like salt and pepper, vegetable oil, tea bags and sugar •	We don't have a bathtub •	Windows on the upper level of the apartment are modern double glazed sash windows; windows on the lower level are original windows with the addition of secondary glazing - all are lockable •	The apartment has gas central heating •	Our ‘best fit’ guests are families, couples, solo and business travellers. We will consider 3-4 same gender individuals but booking agreement is subject to our discretion. This was a perfect base for our family holiday. Everything was very clean, well-equipped and maintained. The beds were comfortable and there was plenty of room for a family of 4. The location was ideal for walking to attractions and a bus stop was also very close. Easy communication with hosts. Highly recommended. Amazing views and a very comfortable stay ! We are so glad we rented this flat! It overlooks a huge park, has beautiful views of the water and is close to everything. The apartment is immaculate and had everything we needed for a relaxing stay. Spacious well-presented apartment, very clean and comfortable. Lovely tall ceilings and large windows, in front room, overlooking the common and harbour. Enjoyed relaxing and taking in the ever-changing view, of all the ships sailing in and out of Portsmouth. Southsea is a delight with parks for the children to play, lots of open space, gardens, Canoe lake, Blue Reef Aquarium and even a proper mini-golf course! We had lots of lovely walks along the beach. Portsmouth centre is lively and busy – lots of great shops and plenty of museums to explore too! This time we took a short ferry hop over to Gosport, to the Submarine museum. A lovely stay and a great apartment. Highly recommend it, if you are interested in staying in this area. We absolutely recommend this apartment and really would like to come back - hope that everyone who will stay there in future will take care of it. Wir waren zu dritt für 4 Nächte im Juli 2017 in Portsmouth und haben uns in der Wohnung sehr wohl gefühlt. Die Wohnung war sehr sauber, schön eingerichtet und mit einem tollen Blick. Wir haben unsere Zeit genossen und können die Wohnung uneingeschränkt weiter empfehlen. Die Betreuung durch die Vermieter verlief reibungslos und absolut freundlich. Vielen herzlichen Dank! Local parking - parking in the area is 'pay and display' as well as residents parking. We can arrange a Visitors Parking Permit for the duration of your stay if needed. Visitor Parking Permits cost £2 for 24 hours. Travelling By Train - the closest train station to the apartment is about 20 minutes walk and is ‘Portsmouth Harbour’ station (near the area of Gunwharf). Other train stations in Portsmouth are ‘Portsmouth & Southsea’ (near the area of central Portsmouth/ Commercial road) and ‘Fratton’. Travelling By Bus - there are several bus stops within a few minutes walk of Western Parade. The closest bus stops are on Duisburg Way and Osborne Road. Slightly further away are the bus stops on Jubilee Terrace. Taxi use in Southsea / Portsmouth is popular and fairly economical. Ask us for local taxi company details if you need them. •	Our ‘best fit’ guests are families, couples, solo and business travellers. We will consider 3-4 same gender individuals but booking agreement is subject to our discretion. •	Price per night Monday-Thursday £123, Friday, Saturday, Sunday £140. •	Price per night 28 June 2019 to 3 September 2019 £140. •	Minimum nights stay apply depending on season. Variations can sometimes be agreed, please enquire.